Even though its a chilly Fall day, the early Autumn sunlight warms the rocks and boulders surrounding this family's home. The momma bear has brought her cubs out to enjoy this beautiful day. Black bears are very shy, rarely seen by humans. 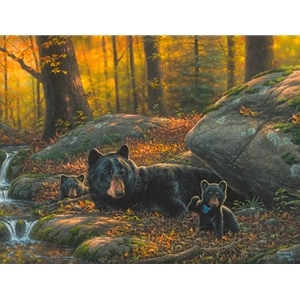 But in this painting, you're invited to share in this precious moment, where mother and cubs rest and play in the comfort and safety surrounding their den. The momma bear has picked a perfect home site, next to a crystal clear, high country creek. Today, the shyness of the cubs has been overpowered by their immense curiosity. They are now brave enough to explore this big world outside the den, and say hi to a bright butterfly.